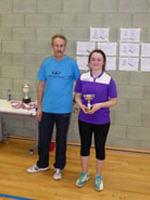 Now in its 3rd season ESJBA hosted its annual TEAM challenge event at the Hailsham Community College. 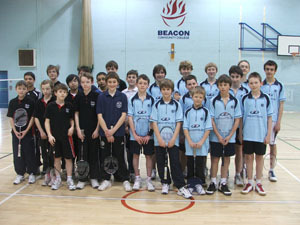 The event was organised as a 4-way team competition in two age groups; U13 and U15-17. 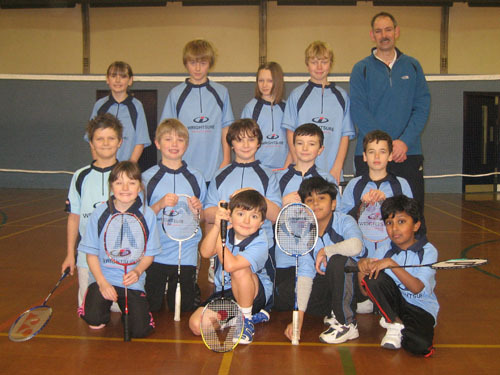 Badminton clubs from across Sussex were invited including Worthing Juniors, Lewes BC, Forest BC and St Johns BC. 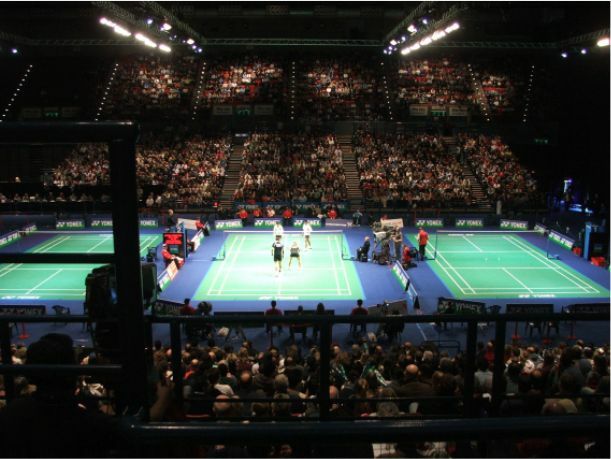 The event is styled on the NBL competition where each team of 6 (3 boys and 3 girls) plays one match against the other 3 teams with the result being decided as the best of 5 games – boy’s and girl’s singles, mixed doubles and boy’s and girl’s doubles. To increase the tension, the teams can use a “power play” shuttle to claim 2 points if they win a chosen point. 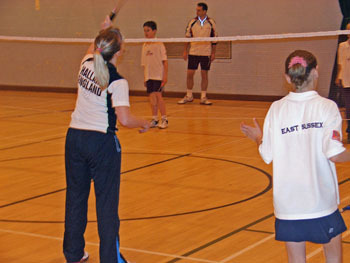 Teams played each match on a dedicated court with a volunteer umpire. This meant that players and supporters watching from the side lines could cheer on their respective team mates which really added to the atmosphere in the hall. Team coaches were allowed to motivate between ends and games and help players with tactics & choose when to play their power play shuttle. 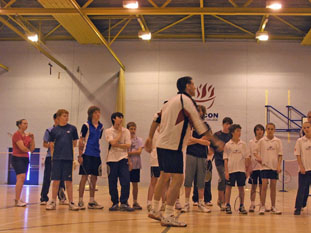 The event as always provided some exciting and competitive badminton. 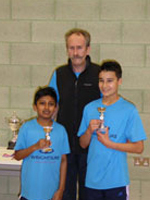 In the U13 event, Worthing Juniors won all their matches and proved a little too strong for the other teams. In the U15-17 things were a little closer. 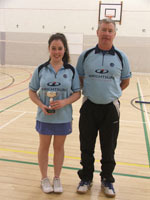 The winners, ESJBA, won all their 3 matches, but two matches were won 3-2 with results hinging on a 5-4 win in the deciding end of the mixed doubles. Trophies were awarded to the winning clubs who will be asked back next season to defend their trophy! A special thanks to the coaches and helpers from WJ, St Johns, Forest and Lewes for their help on the day and making the event so enjoyable for the players involved. Wish I had worn my other shirt now. 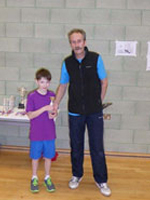 Martin’ Forest Team Manager, Gill Fareham reported ‘Our players enjoyed the format and supporting their team, with the choices when to use the ‘powerplay’ shuttlecocks. The venue and the organisation were very good too. 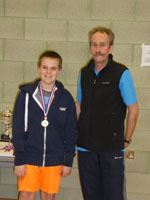 Worthing Junior Team Manager, Chris Brierley also said ‘We thought the venue was excellent, it was good that parents could sit and view the courts from above, helped our parents who had players in both age groups! 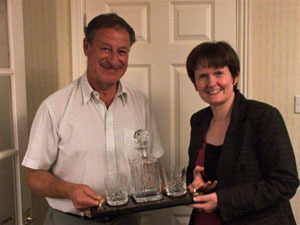 Whirlwind success-or is it woodwind? Leah blowing her own…..flute. 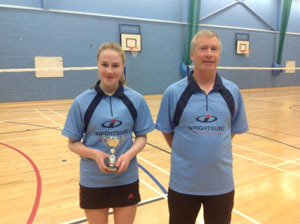 U15 Squad player, Leah Hallinon shows even more skills by achieving first place in the U16 at the Eastbourne Music and Arts Festival. Not only a determined player and personally showing a strong resolve after coming back from a serious ankle operation last season, terrific news has been received that Leah Hallinon achieved first place in the U16 Woodwind and Brass Solo category at the Eastbourne Music and Arts Festival. This is the second consecutive year that Leah has won this cup. The standard of competition this year was especially high, there were 6 other flautists in her category and other instrumentalists including an oboist. Leah was the 5th person to perform and one of the competitors who played just before Leah, had already passed her grade 8 ABRSM flute exam and is currently studying the flute at the Royal Academy of Music JR department. 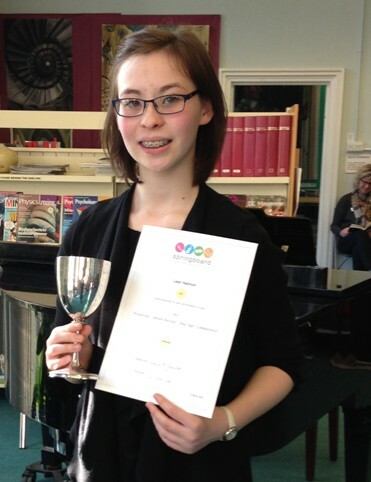 An adjudicator awarded Leah a total of 87 marks – Distinction – which won her first place. Leah came first at Brighton and Hove competition with honours, and having been awarded many scholarships for her flute study, is soon to be performing at the Royal Albert Hall and the BBC studio in London with the BBC Orchestra. She was recently offered a place to study at the Royal Academy of Music in London from this September. This sadly means that Leah will no longer be abler to train and play for ESJBA next season, so we wish her well and if she ever gets tired of all that blowing, she can join us for a session and hit a few shuttles. 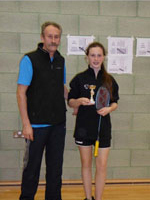 Congratulations to U17 squad player Rosabel Oliver for recently gaining her UK Level 1 Coach qualification. 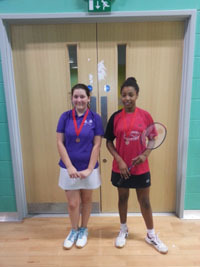 Rosa has been squad player with us for several seasons and has assisted coaches over the seasons outside of the Squad sessions and has decided to further her career in badminton by becoming a coach. Rosa already assists at her school and we look forward to adding her to our roster of support coaches and hopefully see her putting her new skills into practise with our players next season. 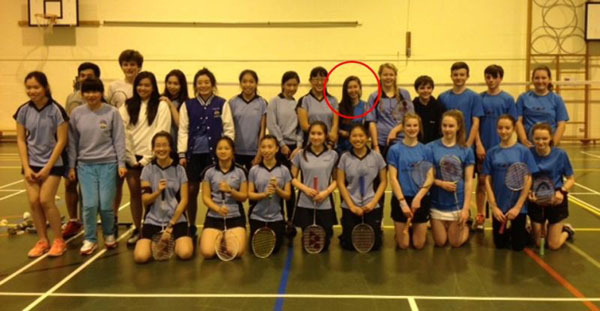 Picture shows Rosa at the recent match with Roedean. 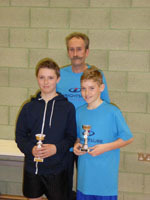 Results and photos now on the Tournaments page. 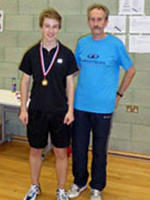 Redbridge over the weekend, narrowly missing out on a place in the final. 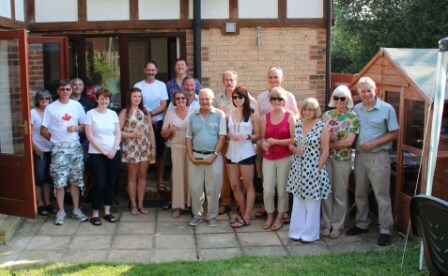 On Sunday 21st July, ESJBA celebrated their 10-year anniversary with a summer BBQ. Among the guests were former and current committee members, a former U17 squad player and England International, Heather Olver. The Association started in 2003 and has seen 20 Committee members in that time, 13 coaches, 6 Parent/ rep/Committee, 1 match secretary, 1 Publicity Officer’, 2 Treasurers, 3 Chairmen, 2 Vice Chairmen and 3 Secretary’s (position still vacant) offers anyone? 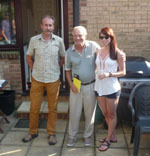 This was a joint celebration as Bruce Peapel, founding member had recently announced his retirement from the Committee. 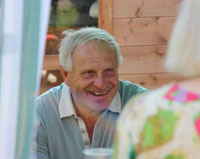 Bruce had served on the committee for three seasons as Chairman and continued either as Squad Coach or support coach. 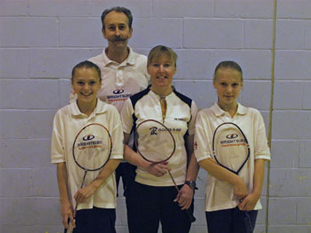 Bruce’s prodigies had included local girl, Heather Olver, and had coached her from the early age of seven. Through her years of climbing the ladder to her current status, Heather has always kept in close touch with her mentor, Bruce. William Brown, Chairman and only other founding member, on behalf of the Committee, read from an extract of one of Bruce’s early hand written ‘Chairman’s reports and presented him with a voucher for ballet tickets, another of Bruce’s passions. 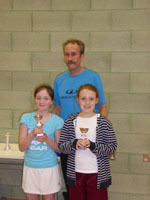 Bruce continues to coach at local primary schools and provides many of our very young players. 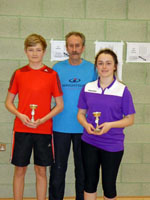 Sunday 8th saw the 11th Annual East Sussex Junior Championships. 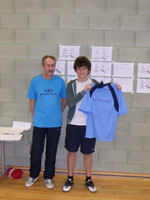 For the second year the event was held at the 6-court University of Brighton Sports Centre, Falmer. This event is aimed at those players who are not selected for the County teams. 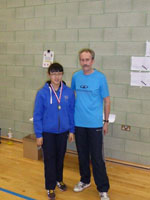 Once more the tournament ran to a very tight schedule and managed to complete 15 minutes ahead of schedule. 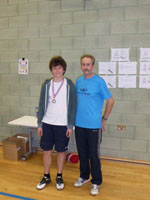 We had a total of 58 entrants from across East Sussex. 33/25 boys/girls. A total of 169 games were played over 7 hours. 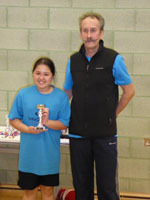 Presentations were made by William Brown, Chairman of East Sussex Badminton. This was also the fourth year of presenting the Kevin Marquiss Award. 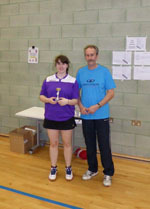 This went to Jessica Newberry (St Leonards-on-Sea) one of our U17 players who also represents Sussex in the U17 Squad. This award was in honour of Kevin Marquiss, one of the Association’s founders who sadly passed away seven years ago with cancer. This award is made from all the squad coaches combining their players and based upon attendance, attitude, ability and personality. 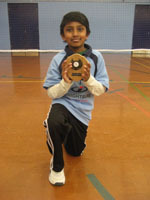 This year we also presented two signed shirts by England No 1 Men’s Singles player, Rajiv Ouseph. These went to Beth Montgomery (Heathfield) and Teddy Rennie (Lewes), both voted as most outstanding, well behaved player of the morning and afternoon sessions respectively. 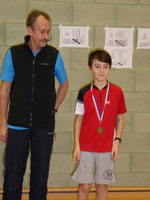 The morning session was for the U11 & U13 age groups plus an U17 Mixed doubles group with no less than 12 players from Reodean School, who managed to walk away with six medals. 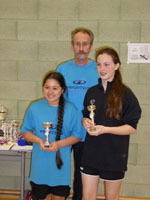 In the afternoon it was the turn of the U15 and U17 age groups. 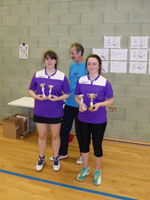 The results were that 14 out of 48 of the trophies were taken by players from the ESJBA squads and at least four in each age group. 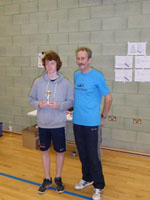 Once more there was a much bigger entry in the older age groups this year, and competition was strong in all the events. 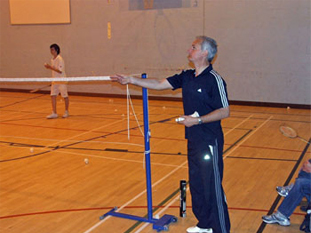 The object of the Association is to encourage the development of badminton in East Sussex, and managing of its Squads. 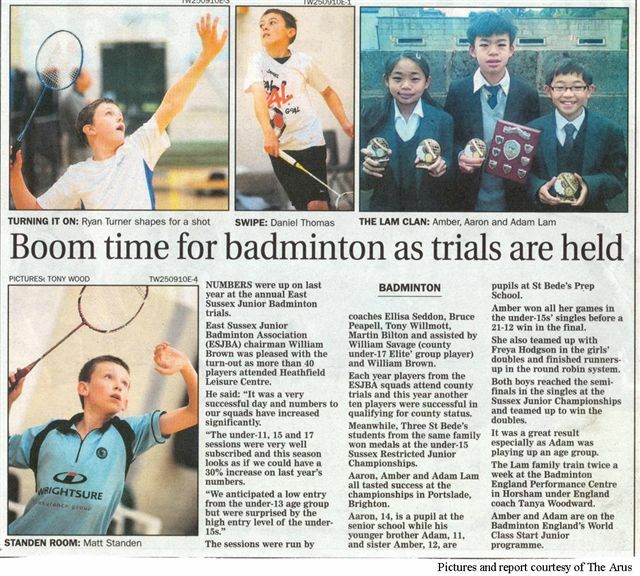 We also aim to support progression in badminton and ultimately this often means a player improving sufficiently to be selected for the Sussex County squads. Each year many of our players go on to achieve this next step and some decide to continue training with both ourselves and Sussex. The only difference with these more advanced players is that they will not be eligible for our Annual Championships and will be second choice for friendly team selection. We feel it is the onus of SCJB to provide sufficient stimuli for these players. 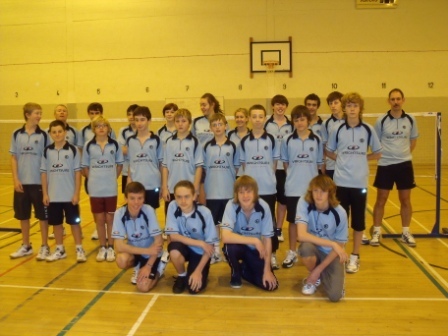 We are there to provide the additional training with professional coaching for those players that require more experience and knowledge of the sport to pursue their ambitions. 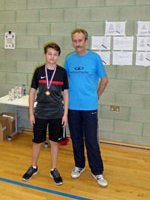 See tournaments and match pages for new photos and reports. 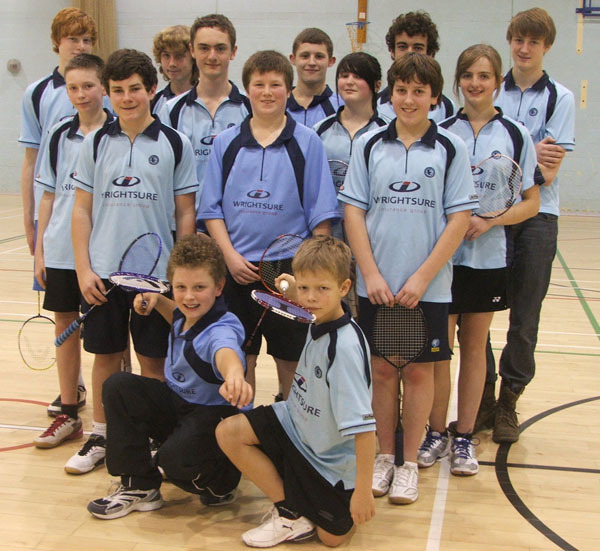 Match Feb. 2010 – ESJBA v Castlemaine/Medway juniors. 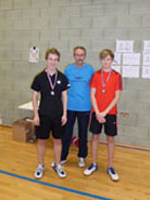 On Saturday 20th March East Sussex’s U16 squad players turned in another winning performance in their first away fixture of the 2009/10 season at the Medway Badminton Club in Gillingham. Nine players agreed to play – Matthew Mundroina, Toby Spillard, Jack Prince, Alistair Middlemiss, Joseph Large, Mark Lee-Falcon, Jordan Medcraft-Colman, Oliver Nelson-Dummett and Matthew Bilton. 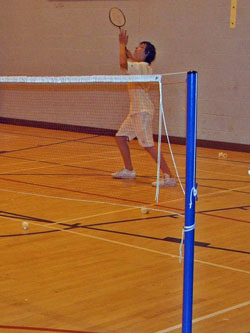 The Medway club is a dedicated badminton facility with 4 courts, refreshment area and viewing gallery/bar. 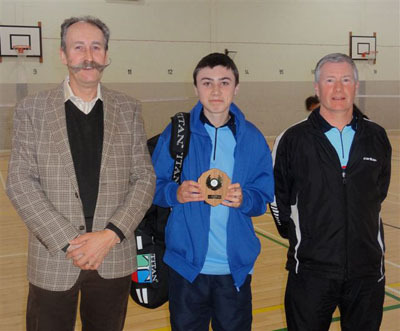 The hosts were well organised, providing teas & coffees for parents, a tea for the players and some competitive matches. 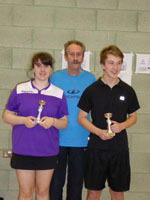 Most players played 2 singles and 4 doubles ganes, with the overall result going to East Sussex 24-9. Well done to all those mentioned, a big thank to the parents who vounteered to drive to Gillingham and to our hosts for organising the fixture and providing such great hospitality. 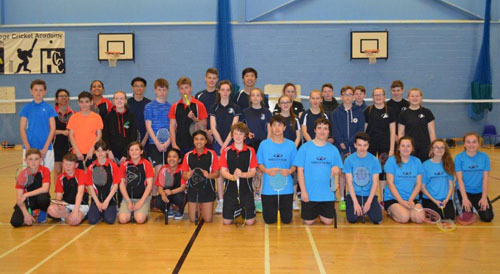 On Sunday 24th January selected players from all three ESJB squads (U16, U13 and U11’s) took part in a home fixture match against Hildenborough Badminton Club at the Beacon Community College in Crowborough. It ended up a close run affair with the last game deciding whether the match would be won by East Sussex or drawn by Hildenborough. 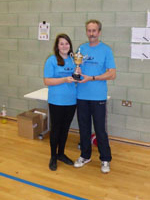 In the end East Sussex won the overall games tally 13 -11. 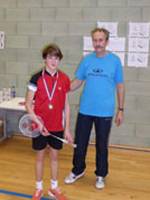 The East Sussex U16 squad proved too strong for Hildenborough on the day winning 11-1. The U13 result was a little more even with Hildenborough winning 4-2 and the U11 players had a tough but enjoyable first outing losing 6-0. 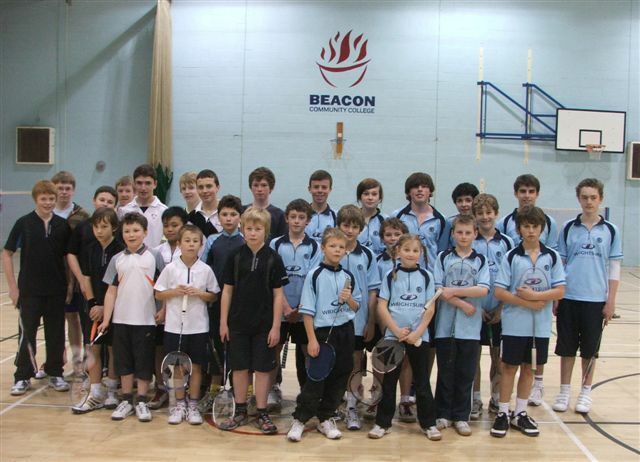 This was a first match fixture for the U13 and U11’s, so a well done to them and to all that competed. 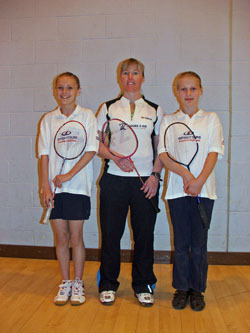 On Saturday 25th April, the East Sussex Junior Badminton Association was treated to a day of coaching from ex International player/coach Steve Butler, assisted by current England International player Tracey Hallum, at the Beacon Community College, Crowborough. Steve presented the youngsters a programme based upon ‘Technique & Timing’. 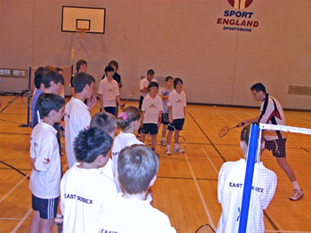 Youngsters from all over East Sussex participated in this exciting opportunity to work with their coaches and the two England Internationals. 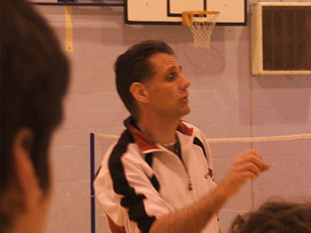 EnglandSteve Butler, earned 75 Caps as an England International, was Commonwealth Games Team Gold medalist, England Junior Coach for 4 Years and the England National Coach for 2.5 Years. 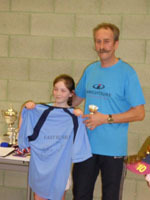 To everyone’s surprise Steve brought with him current England International player Tracey Hallum, and between them demonstrated what dedicated training and enjoyment could be achieved. 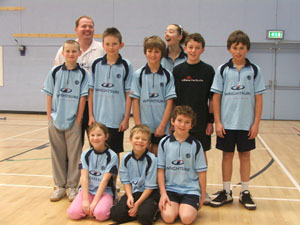 The Association is looking to repeat a similar session, and Steve has invited then to play a friendly match with Warwickshire. 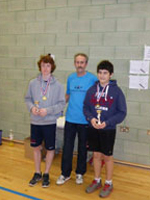 1st – Toby Spillard : 2nd Oliver Rowlatt-Brown : 3rd Stephen Key: 4th David Wexler. Results of the match at Crowborough Beacon, December 2009, between East Sussex and Orpington. Results of the match at Crowborough Beacon 11th July, 2009, between East Sussex and Medway. Under 11: 9-5 to E.Sx. Under 13: 5-17 to Medway. Under 16: 22-1 to E.Sx. 91 games played, where each player played all the other players in the squad.